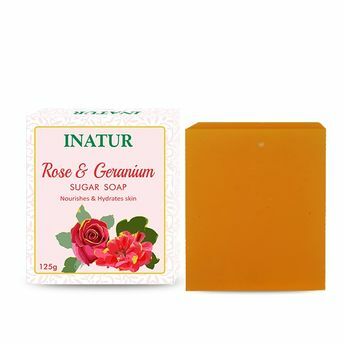 Inatur Herbals Rose & Geranium Sugar Soap is a nourishing and hydrating handmade soap prepared in a traditional manner. It has a soft, floral and divine note that helps to deeply moisturize the skin while gently cleansing it. Sugar and Glycerin are added as base to it to help retain and replenish the moisture in the skin. It contains essential oils that are especially recommended for dry and mature skin. About the Brand: Founded by Pooja Nagdev, a renowned cosmetologist and internationally acclaimed expert on natural ingredients, Inatur Herbals comprises of a wide range of natural skin care, hair care and personal care products that are safe on skin and result oriented. Their products have certification like GMP, ISO & HALAL, and are awarded for sophisticated environment and quality management systems. The brand believes that healthy skin is happy skin and so the brand is committed to ethical, natural and honest skin and hair care solutions that bring out the best in you and for you! Explore the entire range of Soaps available on Nykaa. Shop more Inatur products here.You can browse through the complete world of Inatur Soaps .